20 spacious, certified assisted living flats for sale in the heart of Hoogstraten. At the corner of Katelijnestraat and Loenhoutseweg, you will soon see the brand-new Residence De Veiling. The small-scale project will have 20 spacious assisted living flats (72 to 118 m2), with all comforts, with customised assistance and extra services where needed. Most of these modern, certified assisted living flats have a sunny private patio or balcony with a view of the wide Kempish green surroundings. A guarantee for peace and quiet and yet only a stone’s throw from the bustling city centre of Hoogstraten. In short, a new dream home or a unique investment opportunity. In the service flats at Residence De Veiling, every resident quickly feels at home. Here you get the opportunity to live in freedom, with whatever support, care and services you may need. For each of these aspects, you can count on our reliable care partner AW PRO, a specialist in managing and renting out certified service flats. The recognition by the Agency of Care and Health not only guarantees the service, but also the accessibility, home comfort and transparency. AW PRO offers various care and comfort services to each of the residents. At Residence De Veiling, residents may also use the following optional services. Only services used are charged for. Meals delivered, cleaning help, laundry help, handyman service, etc. The ideal merging of rustic peace and vibrant city life. It is wonderful to spend time in the common garden and there is an underground parking option for every resident. Want something livelier? No problem. If you want to have a chat with other residents in the shared living room, enjoy a refreshing drink on the adjoining patio or go into town, it's as easy as 1-2-3. 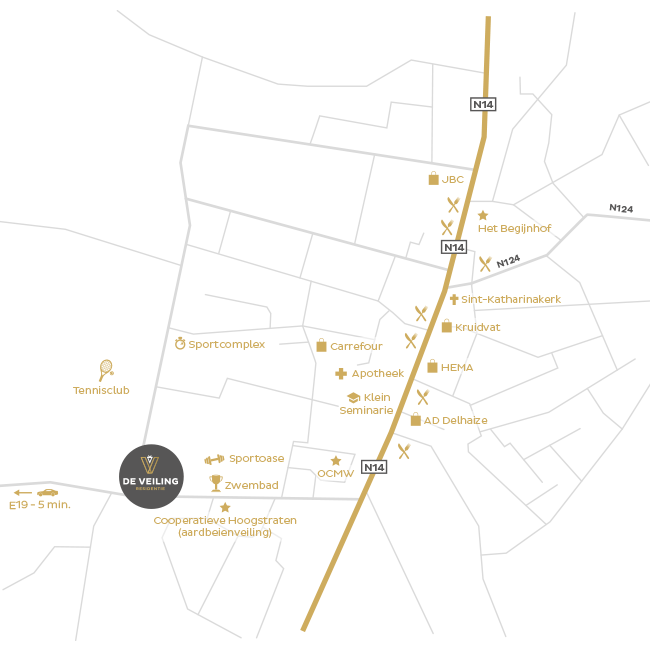 The city centre is within walking distance but can also conveniently be reached by public transport. The bus stop is right across the street. As you can see, at Residence De Veiling, you get to enjoy every day, thanks to the excellent combination of rustic peace and bustling city life. Residence De Veiling can also be great for retirement. You can move in right away or put the home on the rental market (temporarily) and decide for yourself when you will live there in the future. This way you will never lie awake at night worrying about being on a long waiting list for a service flat. Invest in a certified service flat at Residence De Veiling and enjoy monthly rental income or added value later, after the sale. In addition, renting and management are done by a professional management company, so you can be completely carefree. At REALIS you will only find projects that meet the requirements for location, insights into added value, demonstrable profit, correct price-quality ratio, quality aspects, etc. They all earn our RIS label: REALIS Investment Selection. REALIS has been selecting the right projects for the past 20 years. Thanks to its independence and years of experience, REALIS matches the ideal real estate investments with your demands. The result: satisfied customers. The recognition as quality guarantee for residents and owners. The assisted living flats of Residence De Veiling are characterised not only by REALIS’ RIS quality label but will also have the recognition of the Agency for Care and Health. This recognition guarantees quality service and care in accordance with the strict legal standards linked to this. This enables Residence De Veiling to provide an accessible environment where lifelong, comfortable living is not just a dream; it becomes a reality. For owners, the recognition also brings with it some tax benefits in addition to a quality guarantee: a reduced VAT rate of 12% on the building and 10% on the property registration. In addition, as the owner of a certified service flat, you are exempted from property tax. Hoogstraten, everything nearby for optimal comfort. Amid the Flemish strawberry farms in Hoogstraten, you will find the exceptionally peaceful yet centrally located Residence De Veiling. The small-scale residential project with 20 certified service flats is easily accessible by car via the N14 and the E19, but the location is also perfect for getting around by public transport. At the bus stop, right across the street from the brand-new residence, the residents can catch the bus, which takes them to the city centre of Hoogstraten in just a few minutes. It's wonderful to walk and cycle in the green surroundings. Every resident can find the peace he or she is looking for here, without losing the convenience of a centrally located home. There are many shops, restaurants and sights in the vicinity: the late Gothic Saint Katharina Church in all its glory, the Begijnhof with the City Museum of Hoogstraten, the Chapel of the Seminarian, the Castle of Hoogstraten – also known as the Gelmelslot – and much more. Sports enthusiasts will also find what they like here: in the adjoining street (Katelijnestraat), there is a sports complex for young and old, a tennis club and a swimming pool. Prices from €250,200 (+ costs and VAT, including contribution to underground parking garage). REALIS' project specialists are happy to answer all your questions. Urban development info: Permit granted. Community facilities and public use. No summons issued. No pre-emptive spatial planning. No allotment permit. Effective flood-sensitive area. (1) Terms and Conditions provided upon request. (2) Average over 10 years, ovv financing. Simulation based on specific parameters. Terms and Conditions provided upon request. (3) Guaranteed during the term of the contract. (4) Excludes VAT and costs, including contribution to underground parking garage.